Today’s May employment report showed the jobless rate dropping unexpectedly even further to 3.8%–considerably below the level the Fed once considered to be full employment. It wasn’t long ago that the Fed estimated the long-run equilibrium jobless rate in the range of 4.3%-to-4.7%. Economic theory tells us that very tight labour markets can generate inflation pressure, as firms bid up wages to attract and retain talent. The Fed policymakers meet again June 12-13, and it is likely they will continue to remove stimulus from the system, hiking overnight rates another 25 basis points to a range of 1.75%-to-2.0%. By the end of next year, the key overnight rate could be as high as 3.25%-to-3.5%, the level the Fed estimates to be neutral for the economy. Short-term market rates in the U.S. increased this morning immediately following the release of the employment report. Canadian interest rates do not move in lockstep with the U.S., but the Bank of Canada already signalled this week that it would likely hike its target overnight rate when it meets again in July. 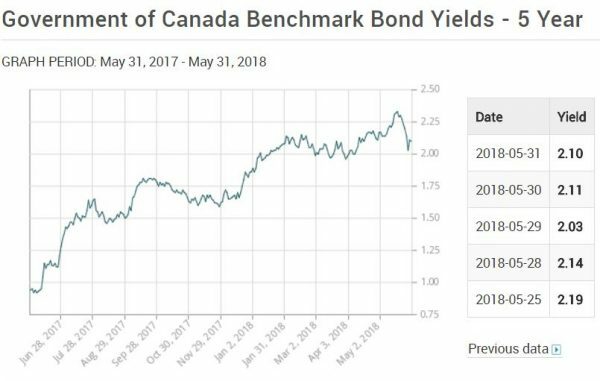 Mortgage rates in Canada have already increased considerably as the 5-year government of Canada bond yield, at just over 2.1%, is up 1.15 percentage points over the past year. Put another way, the 5-year government of Canada bond yield was a mere 0.95% on June 1, 2017, and over the past year, it has risen by more than 120%. With the Fed and the Bank of Canada continuing to hike interest rates, it is very likely that mortgage rates will continue to rise in both Canada and the U.S.